They have awesome lamb gyro's, it is not those cube chunks, they are thin sliced and long pieces of tender lamb. I usually order it with a side greek salad! The food always tastes really good and the service is awesome! They always put a smile on my face. BUTTTT!! I just wish sometimes they could get the food out a bit faster. I have noticed that when their lines get long they tend to take a little longer than your average food truck, but still worth the wait! 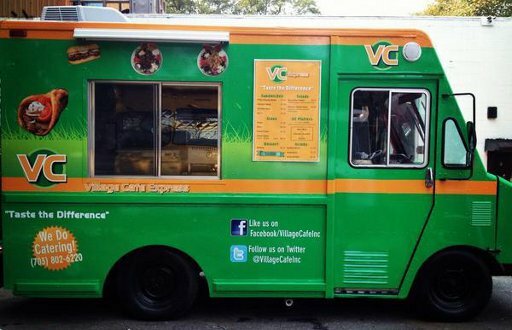 The Village Cafe truck makes killer cheese steaks! I always get a combo meal that comes with a side and a drink for 11$. Great portion of steak, and it is on a toasted sub roll and you choose your toppings. The fries are always fresh and hot and they even have to go ketchup packets, which is a plus for a food truck! Absolutely recommend this truck for others. Not at all what I expected, I got the chicken steak and it was so bad that I ate only half and threw the rest away. The only thing that saved me was the bag of chips. I used my debit card as well so when I looked at my account, I see I was charged $9.90! what a rip off, this is not what was listed. I ordered lamb kabobs. That is not what I received. I received gyro meet rather than kabobs. Not sure if it was just an error or they do not know a kabob should not be pressed meat, but, it should be chunks of meet. That being said the gyro meat was tasty. the rice was excellent. Pretty low quality, not what I was expecting. No kebabs, they were dried out slices with a little bit of tomato, green pep, onion. Pretty bland and meh, decent tziki sauce. Salad is a joke its thin slices of tomato and some canned olives and pepperoncini bits over whiteish iceberg lettuce, no feta, certainly not worth $10. A few negatives and a few positives, but the negatives are mostly common complaints that I have with most other food trucks. --The chicken pieces were a bit dry (but I find this to be the case with any and every place that uses larger pieces of chicken). The light flavor of the chicken was delicious. --The picture of the Kabob Platter showed feta cheese on the greek salad, but there was no cheese at all. I must say that I already expected the chicken to be dry, but I was most disappointed about not having feta cheese on my salad. --The lamb meat was incredible! I have no words to describe how much I enjoyed it! Even with the pieces as large as they were, they were still soft, tender, and delicious! --The grilled peppers and and tomatoes were a delightful addition! I would definitely order from this truck again. *Note to self: Next time ask for more hot pepper slices. I ordered the lunch special of the day, a Brazillian Chicken Wrap with Chips and a Drink, which was supposed to be $9. They informed me that they didn't have chips that day, so I would only be charged $8. Was the sandwich good? Yes. What wasn't good was that I wasn't charged $8, but $10. I was charged $1 more than the special price and $2 more than I was supposed to pay since they didn't have all of the components of the special. I sent them a tweet noting that they made an error. I know they got it, since they have been tweeting since then. Not exactly good customer service. it's predicably average. fresh bun, nothing special with the cheesesteak - lettuce, mayo, tomato slices no cheese, no onions, no peppers; sorry, but it's not really a philly, is it? the fries? well, they were hot, tasty, but they were overcooked. So, I've had worse, I've had better. I might try these guys again. 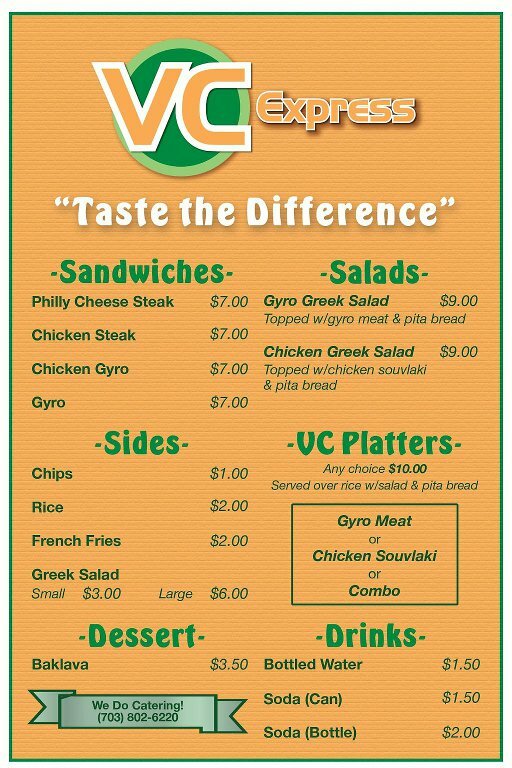 Village Cafe Express serves from a menu of sandwiches and salads (with Greek influence). They started serving on Oct 25, 2012 primarily at GWU in the District. This food truck is the mobile version of their restaurant, located at 5649 Stone Road in Centreville, VA.